The Clearaudio MC cartridge range has a new flagship: the Goldfinger Statement, heralding a new era in hi-fi analogue music reproduction. Our MC V2 range already sets a world reference standard by using a unique patented configuration of eight magnets arranged in a ring. 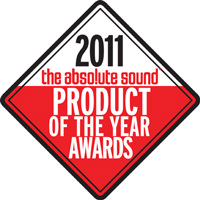 Clearaudio's commitment to ongoing research and development has pushed this technology even further. The Goldfinger Statement features no less than twelve magnets arranged in our patented ring configuration. This generates an intense magnetic field and also allows a significantly reduced moving mass, giving a significantly greater sound performance with new levels of dynamic range, detail and channel separation. The generator coils are painstakingly wound using pure 24-carat gold wire, which - thanks to our new twelve magnet design - has been thinned down, further reducing mass and providing a generator assembly of incredible efficiency. The Goldfinger Statement is also the first MC cartridge in the world to include integrated electro-magnetic field (EMF) shielding of the generator assembly, enabling a new level of sound clarity to be achieved. The 17-gram cartridge body is machined from 585 gold to provide excellent damping against resonances, in addition to Clearaudio's distinctive resonance-damping 12-fingered top plate design (from which the cartridge takes its name). 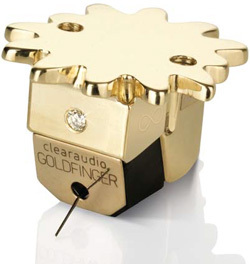 Like all of our V2 generation MC cartridges, the Goldfinger Statement incorporates Clearaudio's patented MC construction principle, which guarantees absolute symmetry of all electrical, mechanical and magnetic parameters, enabling free movement of the cartridge by reducing inertia. As a finishing touch, the Goldfinger Statement features a ½ carat diamond mounted in the front of the body. The best recorded, cut and pressed vinyl LP records are able to provide a dynamic range of 100 dB, which the Goldfinger Statement can reproduce with stunning accuracy. "[...] I am sure that it is the best Clearaudio cartridge I've heard (and I've heard most of them) and, perhaps, the best cartridge (a lot of) money can currently buy." "To hear this thing on a really great, really dynamic recording—such as Clearaudio's own sensational showpiece The Percussion Record—is a jaw-dropping experience. Honestly, this cartridge simply blows the walls out, delivering an almost surround-like soundfield of unparalleled width and depth, with the added bonus of the most thunderous, floor-and-wall-shaking bass (and this record has some bass, folks) I've heard in my room from the Magico Q5s (or any speaker)." "The Goldfinger comes closer than ever to neutrality, adding substantially to overall transient speed and life like timbre without sacrificing any of Clearaudio's traditional strengths in soundstaging, extension and resolution at the frequency extremes, and astonishing low-level detail. Along with last year's cartridge of the year - the Air Tight PC-1 - the Goldfinger is currently the best mc we've reviewed." "The new Clearaudio Goldfinger Statement cartridge goes where no cartridge has gone before, and improves on the already sublime Gold?finger V2."